“Catastrophe” is often used to describe so-called disasters that mark political, economic and social life in the United States. Crises including the de-industrialization of cities, the AIDS crisis, Hurricane Katrina, the rise of mass incarceration continue to have a significant impact on the rhythms of American life in the 21st century. 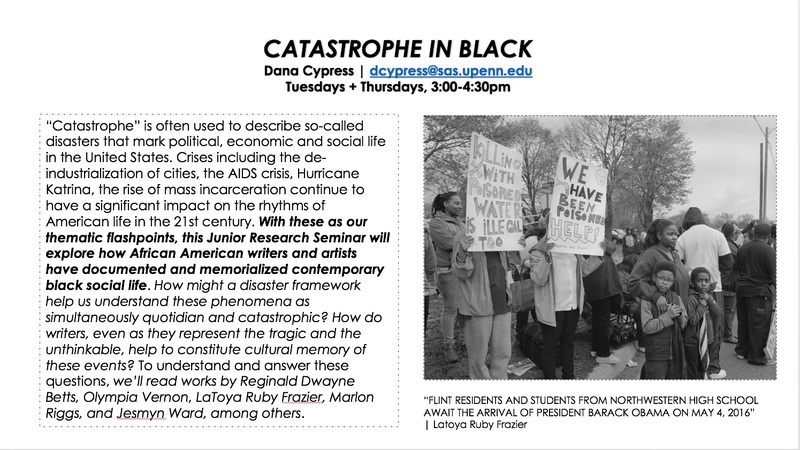 Using these as thematic flashpoints, we will use the rubrics of “catastrophe” and “disaster” to think about how African American writers and artists have documented and memorialized black social life. How might a disaster framework help us understand these phenomena as simultaneously quotidian and catastrophic? How do writers, even as they represent the tragic and the unthinkable, help to constitute cultural memory of these events? To understand and answer these questions, we’ll read works by Reginald Dewayne Butts, LaToya Ruby Frazier, Marlon Riggs, and Jesmyn Ward, among others.This course is a junior research seminar and students should expect to complete several short research assignments related to the course themes that will culminate in an end-of-semester research project.